It took a an awful, tragic event to bring Corey Hall back to the show. 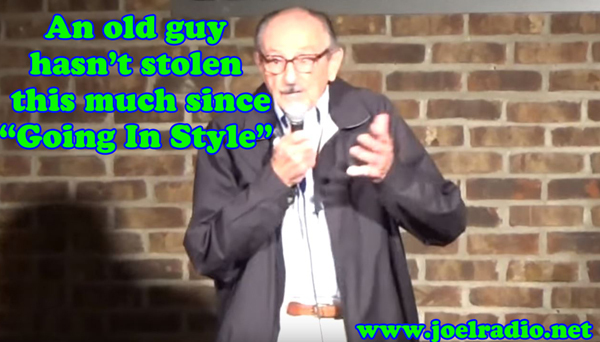 We’re not talking about Paris either, instead an 89-year-old comedian went viral with a stand-up set that was too good to be true. Turns out it was, as most of his jokes were stolen from the internet to a shameless degree. Hear the old codger’s performance, the internet sources for said jokes and Joel and Corey’s analysis of him and the various mistakes that rookie comedians make and why a comedy class setting shouldn’t have allowed this to happen. Also, to the surprise of no one, Charlie Sheen is HIV+ and Joel may or may not have been in contact with him within weeks or months of his diagnosis. Can you get HIV from a microphone? And there was a terror attack this week, as Corey shares his memories of visits to France and Joel wonders if Eagles of Death Metal’s support of Israel played in to the attacks. Plus, Star Wars won’t screen for critics, Back to the Future gets really annoying, Tiny Tim’s debut album is genius (says Joel), Marlon Brando’s dark new documentary, and Aziz Ansari’s Master of None gets the guys thinking about who they’d be in each others’ semi-autobiographical single-camera sitcom.